A new round of twister-spawning storms swept through the South on Monday, killing at least nine people in Mississippi and Alabama as emergency officials in Arkansas searched for survivors in the debris left by a powerful tornado that carved in 80-mile path of destruction through suburban Little Rock. At least 17 people were killed by Sunday's storms, 15 in Arkansas and two elsewhere. In Mississippi, seven people were believed killed, said state Director of Health Protection Jim Craig. One of the victims was a woman killed in a traffic accident that occurred during a storm in Verona, south of Tupelo. Lee County coroner Carolyn Gillentine Greene said the vehicle may have been blwon off the road or hydroplaned. In northern Alabama, two deaths occurred at the Billy Bob Trailer Park west of Athens, Limestone County Sheriff Mike Blakely told CBS affiliate WHNT. Limestone County Commissioner Bill Latimer said he had received reports of more deaths but those had not been confirmed. At least 45 people were injured in Winston County, University of Mississippi Medical Center spokesman Jack Mazurak said. Meanwhile, authorities in Arkansas were picking through the debris left by a massive tornado that plowed through the Little Rock area on Sunday. Fifteen people were killed in Arkansas, while separate tornadoes killed one person in Oklahoma and one in Iowa. The tornado that slammed into Vilonia, Ark., about 10 miles west of the state capital, on Sunday evening grew to about half a mile wide and was among a rash of tornadoes and heavy storms that rumbled across the center and south of the country overnight. The National Weather Service warned that more tornadoes, damaging winds and very large hail would strike in parts of Mississippi, Alabama, Tennessee and Louisiana on Monday. "We've got a powerful storm system affecting the eastern two-thirds of the United States over the next few days," said Russell Schneider, director of the Storm Prediction Center in Norman, Okla. The National Weather Service said at least 31 twisters have been reported since Sunday, and there is widespread damage in several states. 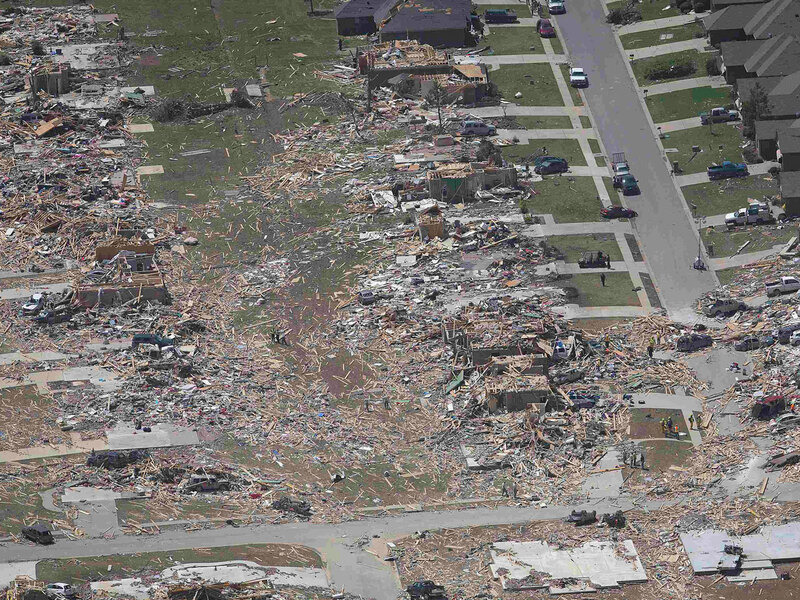 The Arkansas tornado carved an 80-mile path of destruction as it passed through or near several suburbs north of the state capital, including Vilonia. "It was about the scariest thing I've ever been through in my life," Vilonia resident Bob Van Buyssum told CBS News. "The house came down on us." For this small community of less than 2,500 people, nothing but rubble was visible. Among the ruins was a new $14 million intermediate school that was set to open this fall. The weather service's North Little Rock office said it was virtually certain that the Mayflower and Vilonia storm would be rated as the nation's strongest twister to date this year. "It has the potential to be EF3 or greater," said meteorologist Jeff Hood. EF3 storms have winds greater than 136 mph. "Based on some of the footage we've seen from Mayflower and where it crossed Interstate 40, things were wrecked in a very significant way." Two sisters and their father s were killed in a tornado that touched down in a neighborhood straddling the border of Saline and Pulaski counties. Emily Tittle, 17, said her father, Rob Tittle, 20-year-old sister Tori and 14-year-old sister Rebekah were killed in the storm. She said her other six siblings were taken to hospitals, but three have since been discharged. She said her family sought shelter beneath the stairs of their two-story home, but only half of them made it before walls were torn off their home. Emily Tittle returned to the rubble Monday to search for personal items and photographs. "I don't know if we can find anything," she said. The Arkansas tornado was the largest of several produced by a powerful storm system that rumbled through the central and southern U.S. In southeastern Iowa, a woman was killed when either a tornado or powerful straight-line winds caused a farm building to collapse. Another twister killed a person in Quapaw, Okla., before crossing into Kansas to the north and destroying 60 to 70 homes and injuring 25 people in the city of Baxter Springs, according to authorities in Kansas. Authorities identified the person who died in Quapaw as 68-year-old John L. Brown, of Baxter Springs, Kan., who was traveling through Quapaw with his wife when the severe weather hit Sunday evening. Officials said the couple pulled into a parking lot and a large concrete wall fell on the car, trapping both inside. John Brown was pronounced dead at the scene. His wife was transported to a local hospital and treated and released. Her name has not been released.